The moon has rightly captured our attention — while the sun might be wrapped up in memories of warm summer days and fond memories with friends, the moon has a unique place in our lore. That's because it's the closest thing in the sky that we can look directly at and admire. The moon has been the subject of everything from stories, to songs, to poems. Capture that beauty on your desk or in your office with Levimoon. 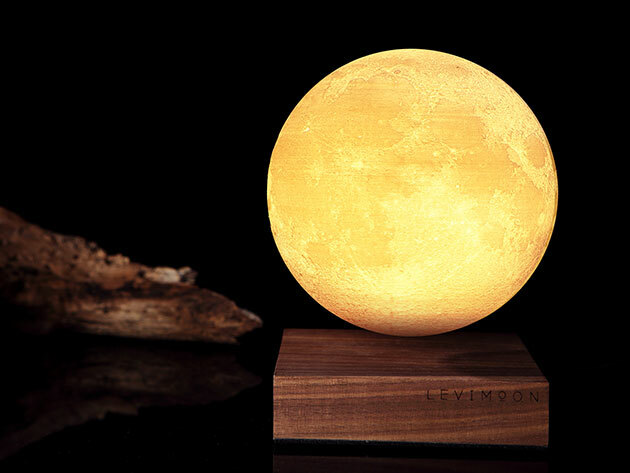 The world's first levitating moon light makes a unique and eye-catching piece of decoration. Successfully funded on Kickstarter and Indiegogo, this light acts like a total restoration of the moon — meaning there's nothing artificial about it; it's meant to mimic the texture of the surface of the moon. The changeable brightness and colors also replicate the different stages of the moon, from the warm yellow of a harvest moon to the intense, pure white of a new moon. Its slim and elegant docking with the sophisticated walnut base makes it the perfect addition to an office or living room — and also a charming night light for the astrologically inclined. It's easy to set-up, with a simple levitating operation that can work 24/7 and recharge wirelessly. Usually $289, you can get the Levimoon here for $199.99.